NETWORK FINALS: The rerun of GOTHAM lost 0.1 in final numbers. CABLE HIGHLIGHTS: The 2-episode premiere of MTV’s DOUBLE SHOT AT LOVE led Thursday cable at 0.51/0.50. ESPN’s afternoon coverage of THE MASTERS was at 0.46 (and was disproportionately big in the 50+ demo at 1.63). On History, SWAMP PEOPLE rose 0.07 to 0.33, and THE AMERICAN FARM was up 0.08 to 0.24. A&E’s THE FIRST 48 was at 0.33, and THE HUNT FOR JONBENET’S KILLER was at 0.20. 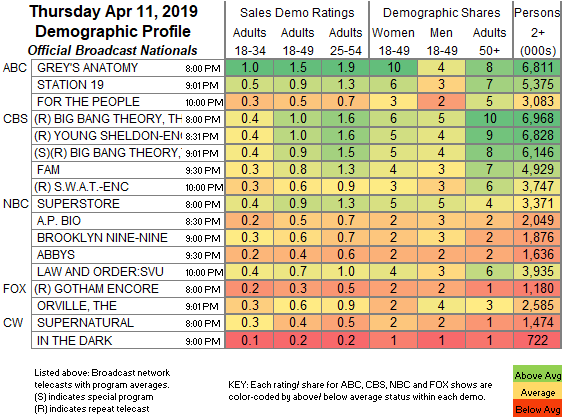 On Tru, IMPRACTICAL JOKERS climbed 0.08 to 0.31, and TACOMA FD was up 0.04 to 0.24. Food Network’s BEAT BOBBY FLAY gained 0.03 to 0.31. The BET REMEMBERS NIPSEY HUSSLE special was at 0.28. Fox News’s TUCKER CARLSON TONIGHT and HANNITY tied for the cable news lead respectively at 0.26/0.43/3.1M and 0.26/0.46/3.5M, with MSNBC’s RACHEL MADDOW SHOW at 0.20/0.32/2.6M and CNN’s ANDERSON COOPER 360 at 0.14/0.19/900K. On VH1, RUPAUL’S DRAG RACE dropped 0.07 to 0.24, and UNTUCKED was down 0.04 to 0.18. The NHL PLAYOFFS were at 0.24/0.23 on NBC Sports Net and 0.21 on USA. 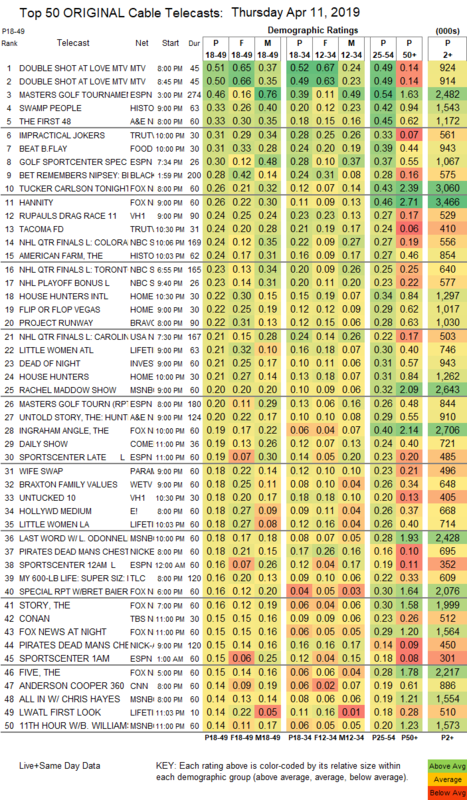 On HGTV, HOUSE HUNTERS INTL fell 0.07 to 0.22, FLIP OR FLOP edged up 0.02 to 0.22, and HOUSE HUNTERS was down 0.05 to 0.21. Bravo’s PROJECT RUNWAY ticked up to 0.22. Lifetime’s LITTLE WOMEN ATLANTA grew by 0.02 to 0.21, and LITTLE WOMEN LA was up 0.05 to 0.18. On ID, DEAD OF NIGHT lost 0.05 to 0.21. Paramount’s WIFE SWAP rose 0.05 to 0.18. On We, BRAXTON FAMILY VALUES was steady at 0.18, and HUSTLE & SOUL ticked down to 0.10. E!’s HOLLYWOOD MEDIUM gained 0.04 to 0.18. Freeform’s CLOAK & DAGGER was at 0.13, compared to last week’s 0.15/0.11. FX’s BETTER THINGS crashed by 0.07 to 0.08. Off the chart, Showtime’s DESUS & MERO gained 0.02 to 0.03/78K.